The late fall and early winter frequently mark the time of year that camps begin holding organized reunions or get-togethers for current campers. Among the lifelong benefits of attending overnight camps or teen programs are the incredible friendships that children and teens are able to make. 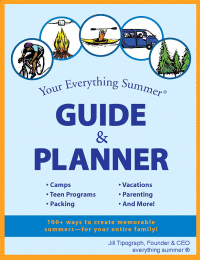 Summer relationships are unique due to the circumstances of a camp or program – kids and teens are in extremely close proximity, living and spending almost all waking hours together. These relationships also develop exceptionally quickly – oftentimes kids and teens show up as total strangers, and within days feel like best friends. And while these friendships are oftentimes a staple of a successful summer, that doesn’t mean they need to be limited to the summer season – and placing a priority on these outside of summer will ultimately serve your children or teens well in the long run. For campers, attending camp reunions and get-togethers can help ease the transition back to camp each summer. Kids return with confidence knowing that they’ve had positive interactions with camp friends since last summer, and this reduces any anxiety your returning camper might have about fitting in at camp. It also gives a shared experience that campers can fall back on early in the summer when they are re-navigating the social waters. And for children and teens of all ages, there is real value to having a group of friends who are completely separated from school and home life –it broadens a child or teen’s perspective to have summer-friends who may come from all over the country or the world, and these friends can provide meaningful support to a child or teen who needs a break from the school-year social world they inhabit. While teen programs are less likely to organize formal reunions, the benefits of maintaining summer relationships are widespread and tangible for teens. Once a student has outgrown camp, they will not be able to return to the formal structure of a daily summer network of “camp friends” that they have grown up with – but there is still value in spending time away from home friends. Camp and teen program alumni who maintain these friendships have a built-in network of people they can reach out to if they want to go on another program with a friend who they don’t go to school with. These friends make the perfect program or travel companions, because teens are already used to living with them in the close quarters of a camp or teen program, and have had success in this situation before. And while some students are comfortable attending a program alone, others will feel more comfortable – and thus will be able to be more socially successful – if they attend with a friend. Summer friends also make great college roommates, especially freshman year. If you’re going to a school where you don’t know anyone – or you want to ensure that you don’t have the exact same friends in college as you did in high-school – then reaching out to a friend from camp or a teen program is a great way to ensure you’ll have a roommate you like, without relying on somebody you know from home. Given how well they know you, summer friends can also recommend a great roommate or friend who will be attending your school. Once again, the close proximity that you experienced in camp or on a teen program will likely provide a good foundation for your relationship as college roommates – after all sharing a dorm-room is nothing compared to sharing a camp cabin or tent. And not only does this provide you with a friendly roommate – it can open your social sphere to any other friends your roommate has at school. And this idea of a broadening network inevitably extends beyond school, and will help your child in the long run. As your children and teens grow, their friendships will also contribute to their professional networks, and the unique shared experience of a summer at camp or on a teen program is a wonderful foundation for a connection. Whether your child or teen grows into an entrepreneur looking for a start-up partner, or a hopeful job-applicant looking for a current employee’s recommendation – by maintaining and strengthening relationships with their friends from camps and teen programs, your child will set themselves up to have valuable friendships grow into vital professional relationships. When selecting a camp or pre-college program for your child or teen, you are hopefully placing them in an environment where they will be able to make deep, meaningful, lifelong friendships. In order to maximize these friendships – by staying close with summer friends beyond the summer season – it is valuable for your child or teen to maintain communications. So encourage them to share e-mail addresses and phone numbers and stay in contact with their summer friends – you never know when life will bring you together again. Newer PostGap Year 101: What Is It, And Is It Right For Your Student?